NZTC is on tomorrow and I hope I've negotiated the last player drop out. A big thanks to Locky Reid for stepping into the Legion of Doom after they had a player withdraw overnight (due to illness). Looking forward to seeing you all along. I received my resubscription notice for Warhammer Visions earlier this week. They told me that my subscription ran out with Issue 14 and that to continue to receive it, I would need to give them some more money. Now I'm wondering how many people have received these since the move to Visions and more importantly how many have provided their credit card details. My sub has been a legacy of the old White Dwarf subscription that was then extended for an additional two years because I complained about the change in product offering, terms and conditions with the re-boot before this. 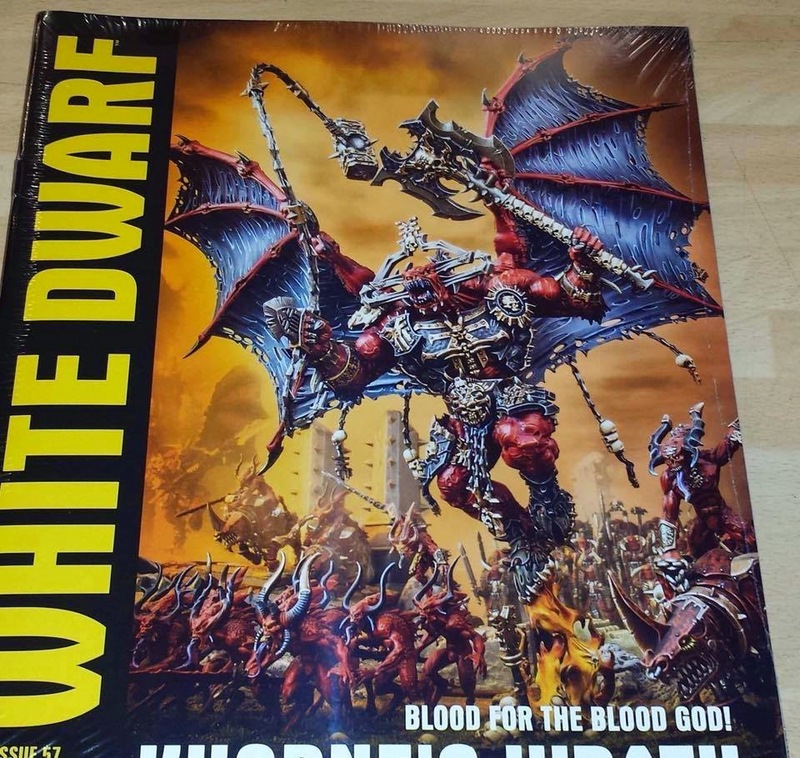 So it's far to say that I'm now at the stage where White Dwarf and I owe each other nothing. The question then becomes whether I resubscribe. Given the last six issues are sitting unread beside my bed, you don't have to be Einstein to guess it's likely to be "no". I used to love "White Dwarf". From 2003-2008 I had both the UK and Asia-Pacific versions via sub. When they rationalised the product I became less enthusiastic and then with each subsequent re-boot - 2012 (new size - good initially then rapidly declined) and the 2014 move to WD Weekly and Visions - ultimately disinterested. 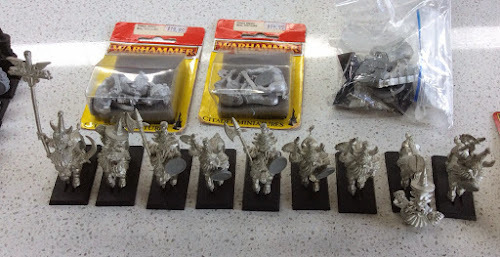 I purchased the first 40 odd WDW but gave it away after ET:Khaine and since then have only bought the Thanquol ones. The reason is that there is little "thought content" in either of the current iterations. Rather they are very visual and reinforce the line GW now sees its customers as "collectors" rather than gamers. This is particularly true with Visions. 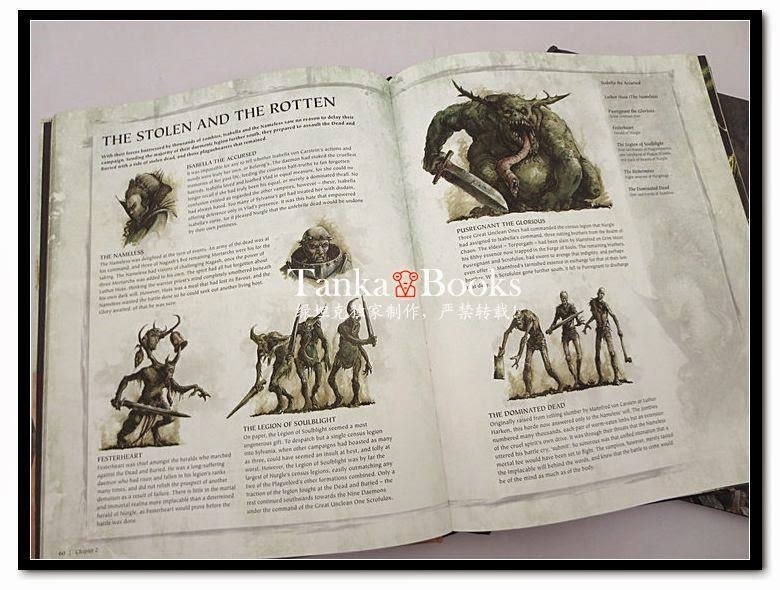 It has beautiful pictures of armies, new releases and Golden Daemon entries in it but being realistic these are only one click away on the interwebz thingy. I'm not sure it is a sustainable business model for a magazine long term and that where my interest in the process lies. I wondering how many people have resubscribed to Visions? I'd guess it is significantly less than 100% and that new subscribers are not making up the slack. Sure it is only supposition on my part but I'd like to think I've read this right. If I am correct then where do we go from here? I always had the view that Visions was just a vehicle to fulfil existing WD subscription obligations and once they roll off then it will fold. But what if it's not? What if it is reflective of GW's New World View of "collectors" versus "gamers"? I guess subscription numbers will give them a clue to how correct they are. This weekend is the New Zealand Teams Championship for WHFB. With over 50 people attending this will likely be the largest Fantasy event of the year here in NZ. As it stands there are twelve teams competing for the Championship - down on the 16 teams who attended last year. The drop in numbers is a little disappointing but reflects a number of last year's attendees rage-quitting in response to the End Times, rumours of 9th Ed, GW's pricing policies - take your pick. Even with a lower attendance I'm picking that the participants will have a lot of fun. The teams concept is a great vehicle for the social aspect of the hobby - and of course there is always someone else to blame for poor performance. I want to give a big thanks to Tim Joss not only for giving up his weekend but also for flying up from Invercargill to umpire the event. Every event needs an umpire and because of Tim's efforts 50+ gamers get to have some fun. Given this meeting of gamers, I've taken the opportunity to organise a Bring & Buy and any locals are welcome to come and check it out and also have a look at the games at the same time. 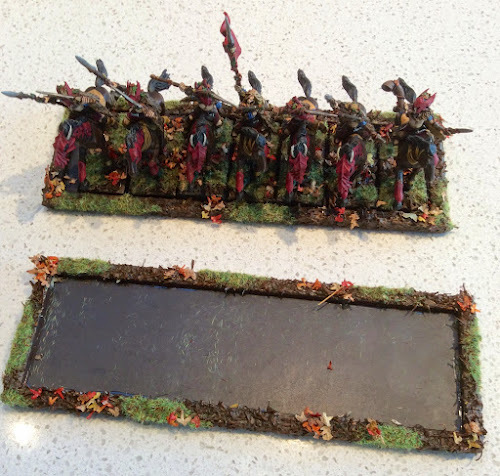 If any locals are interested I am selling some 6' x 4' MDF tabletops and some wargaming basecloths. The boards are good quality while the cloths are a lightweight material, hemmed and in a variety of colours (two greens, desert, brown and grey). As noted earlier in the week this Saturday sees the first releases associated with End Times V.
The White Dwarf has been spotted and you can get a good look at the new plastic Billy. He's a friendly looking chap...sports the requisite number of skulls etc. There are three variants in the kit that will be released on March 6th. Due to an odd number of teams at the NZTC the von Trapp Family stepped out to ensure that there was no bye. Instead the members of the von Trapps will compete for the von Trapp Invitational Trophy. This comprises a round robin, a game of Doubles and a Triumph & Treachery game. And what are they playing for? 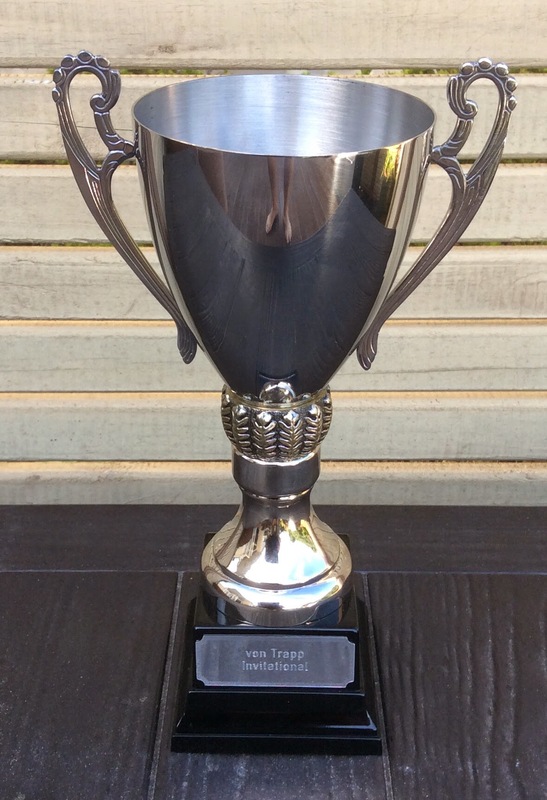 Behold the von Trapp Invitational Trophy in all its glory!!!!! Who will get their name on the trophy? Tom Dunn von Trapp the 2012 Master and King of Final Transformation? Dan Butler von Trapp, two time ETC player and 2014 #1 Ranked Player? Peter Williamson von Trapp, second twice at the NZ Masters? Or Peter Dunn von Trapp, 2014 Master and #1 ranked player for 4 of the last six years? I've received the results for Inepticon that was held the same weekend as last year's Masters and they have been included in the rankings. The results see the winner Alan Hughes move up to 11th. The Big Rats have their eyes on this pretender! The past month has been characterised by a period of the doldrums as the release of Thanquol and rumours of the upcoming 9th Edition Armageddon receded into the mire. 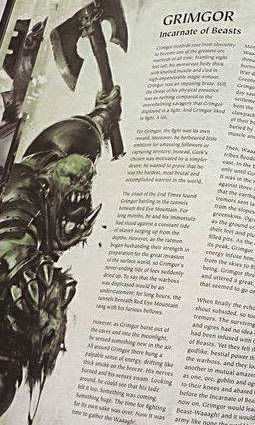 This week starts the next upwave as we get the plastic Bloodthirster announced in White Dwarf - along with its rules. 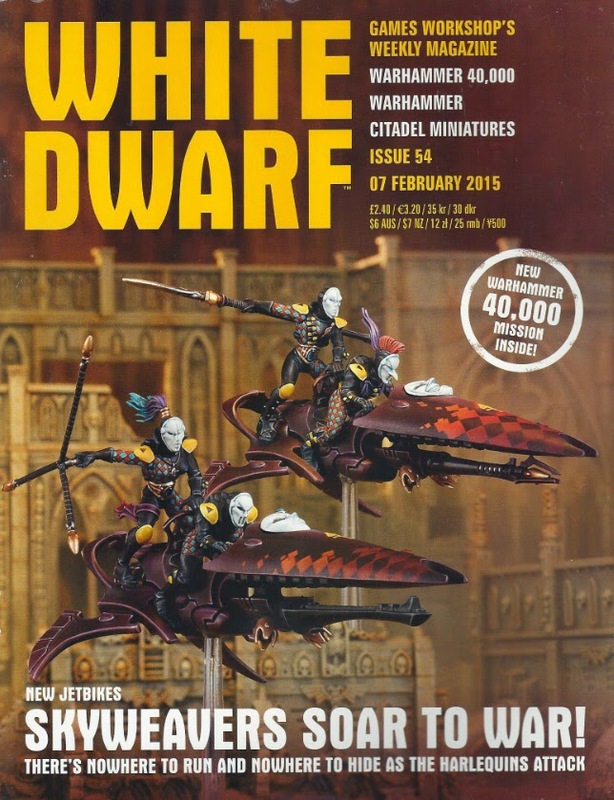 There is no mention of End Times V so it looks like that release will be announced in the first March White Dwarf. It's at this point the gnashing of teeth will start again as the End Times "ends" and the rumour mill for 9th grinds into full production. This week rumours have started to circulate regarding the contents of what has been called the 9th Edition box set. However in the next breath the rumours say that this is a standalone skirmish game set in the new Warhammer presumably post End Times world. Expect the next two-three months to be filled with claim and counterclaim, portents of doom, anticipatory rage-quitting, proposed boycotts etc. The rest of us will get on enjoying the game. Last evening NZTC Umpire Tim Joss did the First Round Draw on Twitter. Running alongside the event will be the inaugural von Trapp Invitational where the four members of the von Trapp team will play a round-robin versus each other, a two player a side game and finish it off with a Triumph & Treachery bout. The US Masters were run over the weekend using Swedish Comp (not sure range). Apparently the play method was to summon Ethereals using the Lore of Undeath to block up the enemy and then shoot them off. Good on the guy for winning with an unfashionable but OMG what is Joe Sleboda going to say now? The Fantasy rankings have been updated for Battlecry held this past weekend. While 40k have had the Over The Top event entered. The next big event in terms of rankings is last year's Equinox falling out to be replaced by the 2015 vintage. On Saturday (Robert) Higgins and I got down to some internecine warfare at the Warlords. 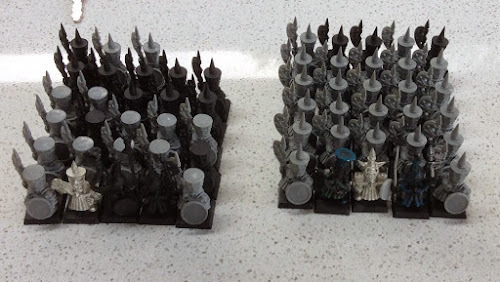 His rats were built around 4 blocks of Slaves 2x 20 and 2x 70 plus a big Clanrat block, an HPA and Plague Monks including a Priest and Furnace. My list was my NZTC list so more shooting, nowhere near as hitty. All in all I believe there were around 400 rats on the table. Well there were.....at the start. By the end of Turn 3 the numbers had dropped to something approaching 150 - and this was with both of us avoiding taking "Plague". The game effectively end in Turn 4 when I managed to get two "Scorch" and a Str 10 Warplightning hit directly on the Seer/Warlord Clanrat unit. Although he failed his "Look Out Sir" the Seer made the 4+ ward. unfortunately when he turned around he only had the BSB and Clanrat Champion with him. Get Out Of My Burrow, Pretender!!! I own a Dwarf army.....albeit the far more honourable Hashut variety. Since I got into Warhammer I have always like the old Assyrian Big Hat Chaos Dwarf models. 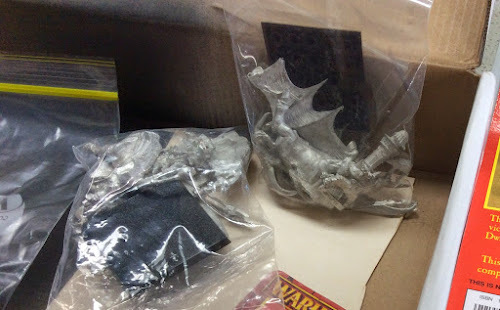 I recently had the opportunity to pick up an army lot of that vintage and I received it yesterday. Here's an army wide shot of what I picked up. One Deathshrieker, one Hobgoblin bolt thrower, an Earthshaker (in bag) plus a hobgoblin khan on wolf (in blister). Unit of 30 Blunderbuss including command. A big unit of Bull Centaurs including two in blister. A Lord on Bull Taurus and Sorceror on Lamasu. These models are all early 90s vintage making them older than Tom! Keen to pick up anymore from the era that people might have in their bits boxes or squirrelled away under the stairs. Just let me know. I was having a look at a few Warhammer race specific forums today and thought it was interesting to see the various "populations" in terms os membership numbers. There was also Asrai (Wood Elves) but that seems to have died a death. The numbers are quite interesting and I suspect are influenced by a number of things - popularity, longevity, general nature and helpfulness of the forum. I was surprised by the numbers for the Herdstone which seems very popular despite no recent book and perceived general army popularity. The only one that I generally frequent is The Underempire and that is infrequently. However I generally find them excellent from the hobby aspects especially conversions - as the populations are mostly enthusiasts. Seerlord Morskitta is feeling decidedly unwell this morning. While venturing into the park to give his hordes of admiring minions a run (caring despot that he is), he was assailed on all sides by bands of pointy eared gits. Not content to pepper him with arrows, he was suddenly transformed into a gold statue. Now no doubt in years to come there will be many statues to the magnificence that is Seerlord Morskitta but the important thing is that they will be at his choosing - must capture the absolute silkiness of his whiskers and all that. He is feeling a little better this morning (thanks for asking) but he may have a lie-in just to be sure. His Omnipotence will be back soon - have no fear. HERE are the lists for the NZTC. Mix of armies on show with Elves dominating. Looking forward to the event - ten days out. The NZ WHFB rankings have been updated for OTT which was held on the weekend. This has also seen last year's Fluffycon drop out though it will be replaced by the upcoming 2015 Fluffycon this weekend. No change in the Top 10 and Army Icons remain tightly held. The drums are starting to beat a very interesting rhythm on the interwebz. Originally there was talk that 9th Edn WHFB was coming in May but over the past 3-4 weeks that particular beat has been shelved. Instead we were hearing that there was a going to be a big 40k surprise instead. Well even that tune has altered. Now the word is that it isn't 40k at all. Instead it is 30k!!!!! 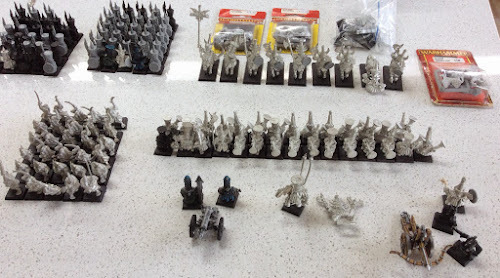 Rumours have surfaced that GW are looking to release a box set with PLASTIC 30k forces in it. Certainly I can see it as plausible from a commercial viewpoint. 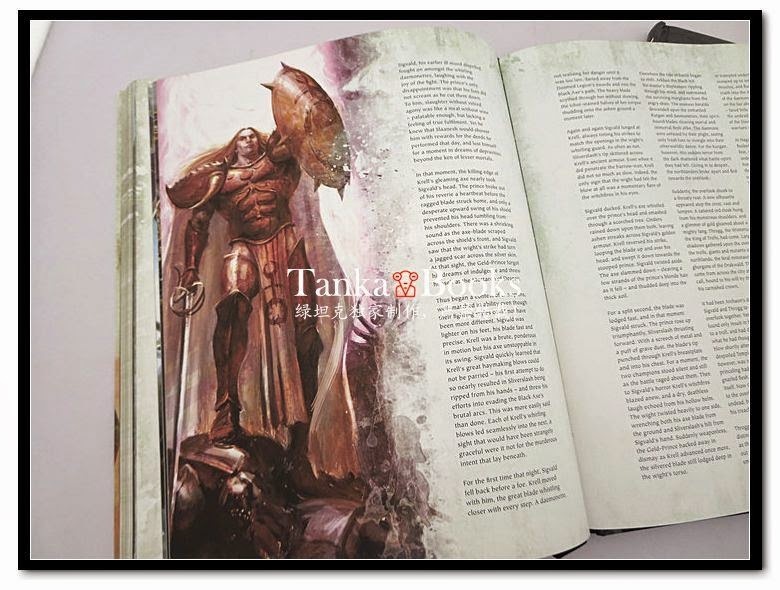 The Horus Heresy has been a cash cow for both Black Library and Forgeworld - you only need to check out the lines for both at events like Adepticon and see the cash registers ringing. 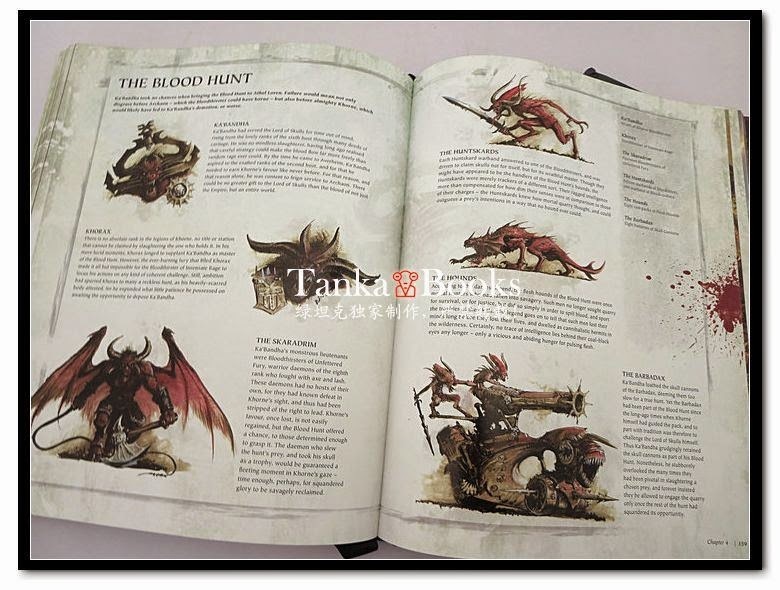 So I can understand if GW want to cash in directly. Personally I hope it is not true. 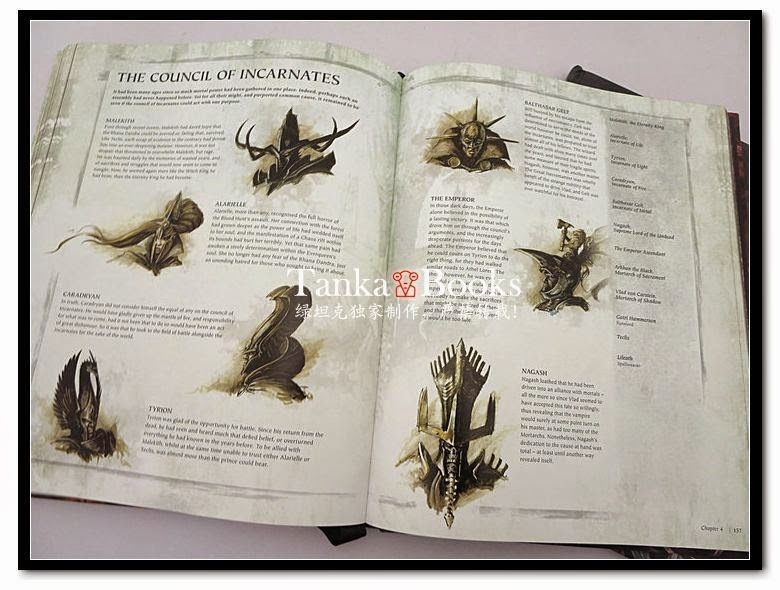 I like the boutique (nice way to say elitist) nature of the Heresy and the Forgeworld product. Still if there is a cash cow to be slaughtered, I can see GW don't it. 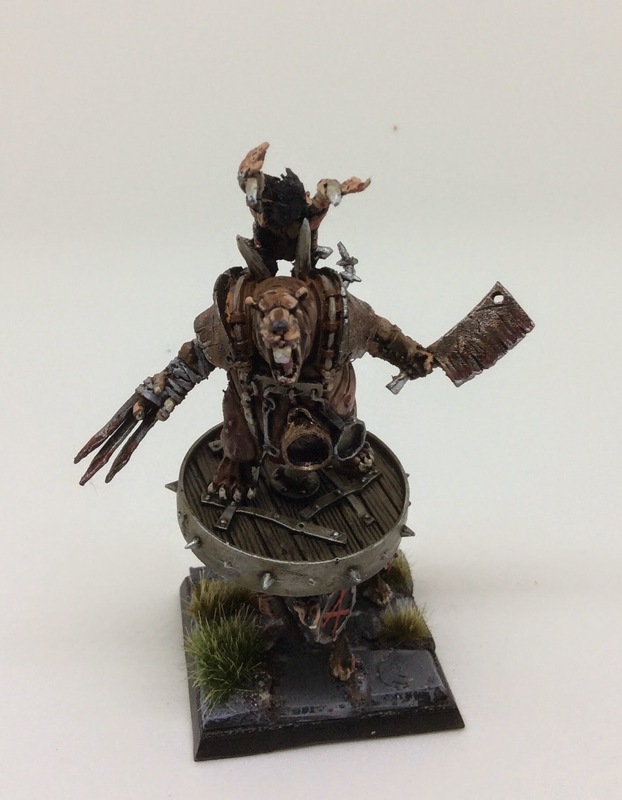 You can see one empty with rubberised steel base and with a unit of Wild Riders in it (all ready for elfy fun). So the weekend saw my first couple of games for three months. 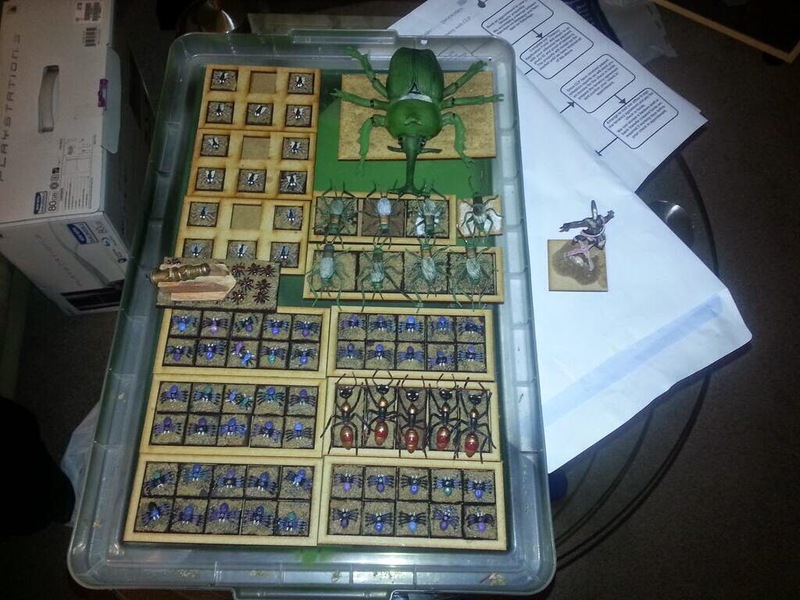 In both cases I played Lizards, the first with a Cold One Cav bus and the second with a Temple Guard block. Both do it hard versus Skaven so from my point of view it was a relatively friendly re-introduction. 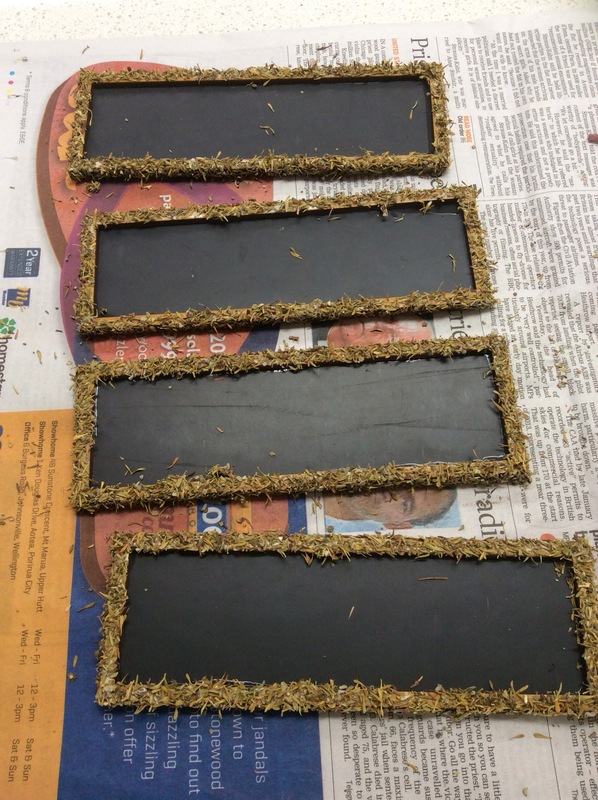 I managed to finished my Realm of Battle Gameboard ready for upcoming games and put together a swathe of new movement trays. 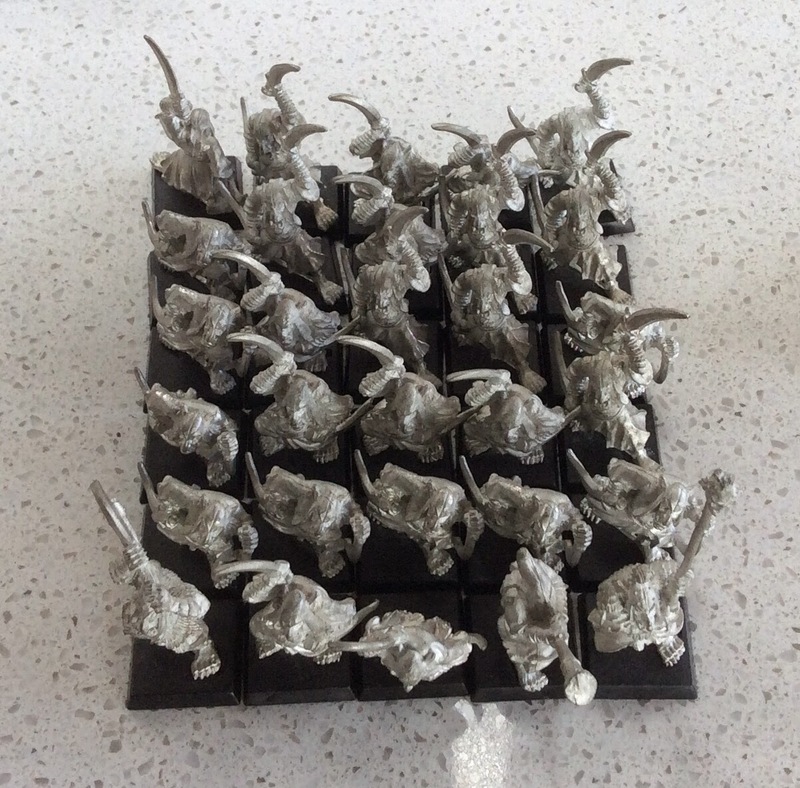 Painting wise this week I'm looking to finish my movement trays and start painting my four ogre Stormfiend unit. Hopefully this week sees End Times V confirmed....I'll be keeping my eyes on the wires to see what the upcoming White Dwarf brings us. I was playing a game against Lizards on the weekend and powered a Doomwheel into the front of a Salamander. The Doomwheel blew straight through the hated acid spitter and had little choice but to overrun (otherwise it would have faced a Temple Guard unit charge). It overran into a Skrox unit that had a Skink Chief in the front rank - far end. After killing one skink from Impact Hits, the Skink Chief declared he had the Egg of Quango and proceeded to open it. He rolled a 4 on his D6 which meant 2D6 Strength 5 hits. He then proceeded to roll double 6 for the hits. This inflicted 7 wounds (5+) leaving me to make three 6+ saves to survive. One save later.....Take It Off!! So here's a tip Kids.....Beware of Smart-Arse Skinks carrying Eggs! Currently making up movement trays for Wood Elf cavalry. 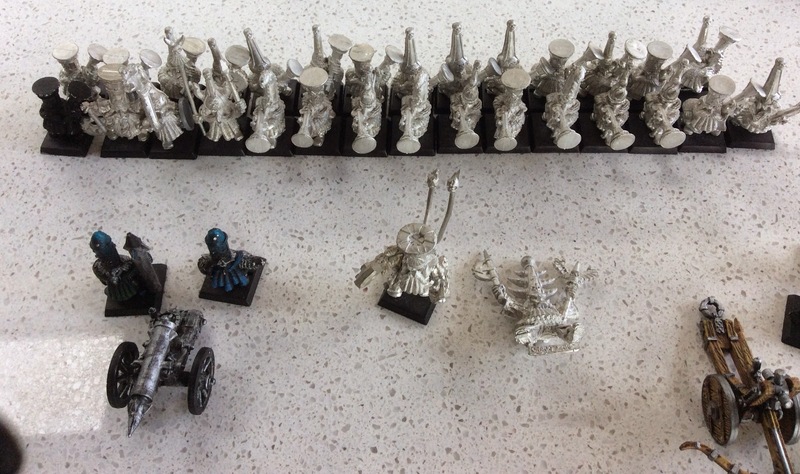 I have a unit of Sisters of the Thorn and three units of Wild Riders to cater for. As usual I have used Sarissa Precision trays. Though they are situated in the UK I think that they have the best turnaround of any company I know. Generally they are here in 5-7 days. One of the benefits is that they are a two part tray - upper and lower - laser cut from mdf. This lets you insert a layer of steel paper (Gale Force Nine) between to provide attraction for magnetic bases. My Wood Elves have forest basing with lots of leaf scatter on them. To provide this for the movement trays I use the same technique. 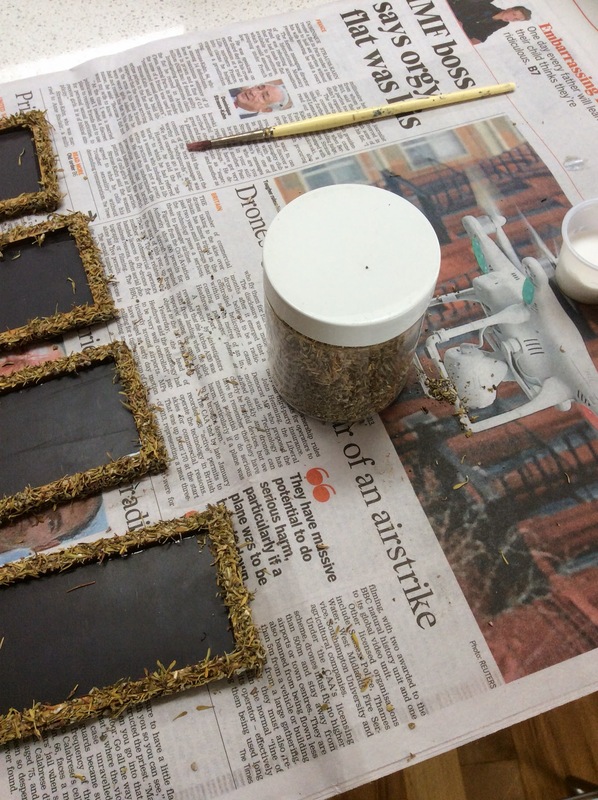 After covering the outside in PVA I then push them into a pile of Mixed Herbs. That's right....raid the spice rack and you can get yourself some realistic looking leaf clutter. Mixed Herbs are the best as you get variety in size and type but Thyme, Rosemary and Basil all will do individually at a pinch. Not only do they look good but they smell marvellous. Well the smell lasts until you first wash then with watered-down PVA and then coat them in you desired base colour. One of the great benefits is the texture which allows dry-brushing. I then apply some Static Grass and SWM Leaf Litter. I'll post some pictures of the final trays later in the week. The last few months have seen me on a real hobby bent with a lot of one-off painting projects, reorganisation etc. This has meant that I haven't actually been playing much. By my reckoning I think I haven't had a game in the past three months. This has left me a little rusty. The NZTC is coming up in a couple of weeks so I'm hoping to get a few games in over the next week or so to shake out the cobwebs. Starting tonight. Hobby-wise I still have one half of a Realm of Battle tile to flock and then I'll have the full 14 done ready for upcoming games. 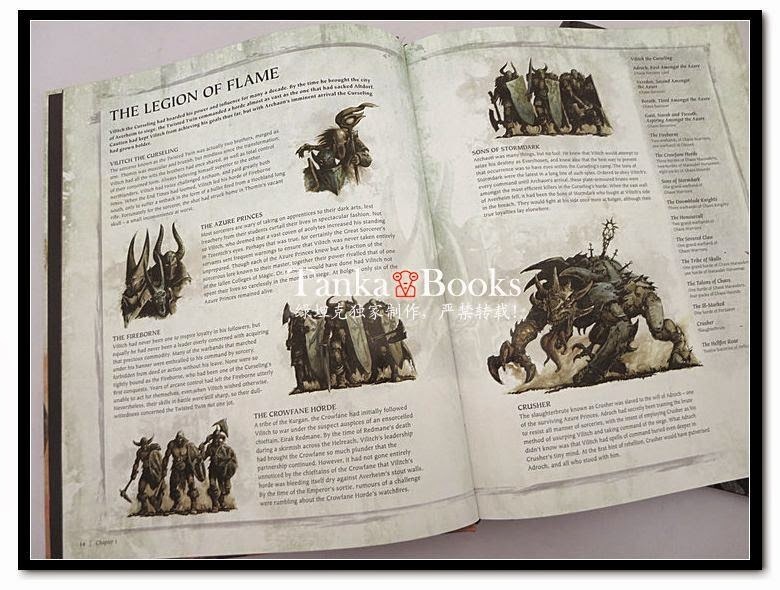 Call me a GW Fanboi (and yes obvious troll is obvious) but I am really excited with what I have seen from the pics of End Times V.
The whole End Times for me has been about the story – the fluff progression – and some of the revealed “forces” are intriguing from that point of view. I want to know if The Nameless has turned on Vlad, digging up his missus and throwing his hand in with Nurgle. Similarly I want to know who Drycha is siding with. She gave up the Elf Princess used in the summoning of Nagash and now Tyrion is back (Boo Hiss) I’m keen to know if he’s out for retribution (face it, he’s got nothing left). The possibility of seeing the carnage unleashed by a mono-Khorne force led by three Bloodthirsters will be glorious but I’m hoping it is against the remnants of the Empire or Elves rather than the Undead. We also get to see Vlad and Mannfred together again and the interactions between them in the first book was one of my highlights. There’s also a strong chance that the Slayer King is dead as he seemed the obvious candidate for Fire Incarnate but appears to be bumped from The avengers playlist. From a gaming point of view I am hoping that army comp is handled through some tightly scripted Battlescrolls rather than the Pic’n’Mix abomination that is Host of the Eternity King. And finally I’m going to enjoy Thanquol finally getting on the Council and the Skaven kicking back and enjoying the world they have won. A Chinese site has posted images from the upcoming End Times V.
I've grabbed the ones that show some of the forces that feature in the story. 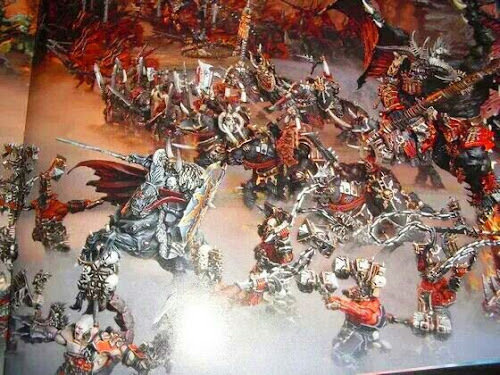 Obviously Khorne features heavily in the story and you can see they put together some "skulltastic" armies. The Avengers Warhammer style. Sad to see Tyrion survived. Wonder if he was picked up in a Dwarfen submarine or by a Black Ark. A serious collection of dead guys. Nice to see that the von Carsteins have kissed and made up. Perhaps the most interesting team up....Drycha and the Dark Elves with Be'lakor in tow. The Wood Elves seem to be working alone. Perhaps they don't like their new neighbours after all. Probably the noisy parties. Vilitch was sent to do a job by Archaon. We'll see how he got on. Another really interesting one. Isabella, The Nameless and Nurgle. Vlad better get her checked out before he gets too close. And one of my favourites....Sigvald. This boy is more than a sandwich short of a picnic. 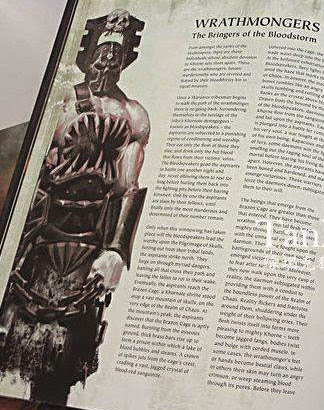 What I like about these screenshots is that on the right it looks like full descriptions of the force - these look like they allude to specific Battlescrolls though - so in keeping with Thanquol. It seems pretty clear that we can expect pre-orders for End Times V to go up in the next few days. Looks like it will be next weekend, following the completion of Harlequin releases. 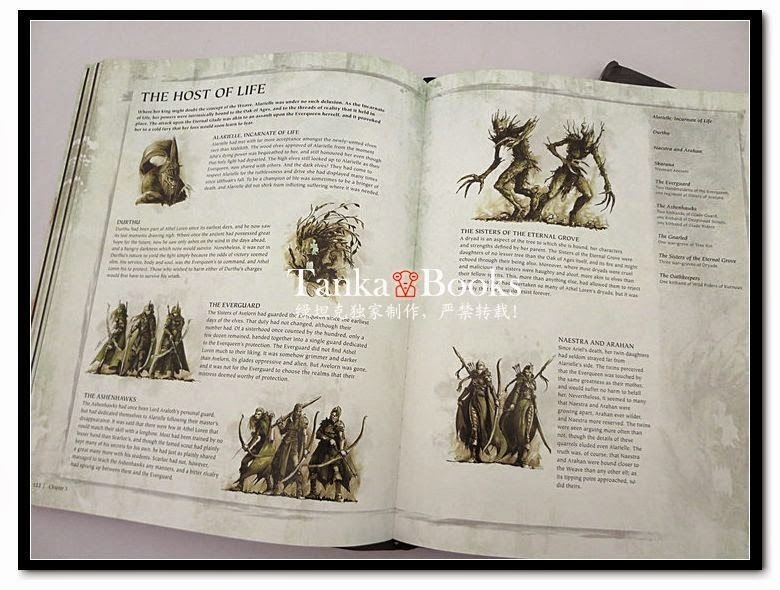 Starting to see leaks of pics of the models (see yesterday's post) and today we have some book shots confirming new units and rehash of existing characters. These guys appear to have the requisite number of skulls to be a Khorne unit. They appear to be Monstrous Infantry, cost 55 points each have Flails, Chaos Armour and Marks of Khorne. They come in units of 5+ so not a cheap choice. I suspect that they are a Rare choice so they face plenty of competition for their spots. These guys are Blightking equivalents so Infantry on 40mm bases. Armed with two handed weapon giving +1 Str Magical Attacks. Also have Mark of Khorne, Chaos Armour and again unit size of 5+. I'm guessing they are a Special Choice. The man (Orc) a lot of people have been waiting to see. His headbutt won Storm of Chaos but I suspect Archaon is ready for it this time given he's had ten years to stew. And another Ascendant. The incantation of Metal no doubt. The UK's largest WHFB tournament is the South Coast GT. It is held in April each year and attracts between 150-200 gamers. The pack continues their use of a pool system for choices which then impact aspects of the game. It is an interesting concept though I wonder how much it dissuades the really hard hard lists. I'm sufficiently interested in the system that I may look at trying it out at a HomeCon in April. The TOs should be applauded for creating something innovative. Whether it addresses the twin issues of comp and incorporation of the End Times remains to be seen. Generally all comp systems - particularly at the outset - just move the goal posts and gamers will move to the strongest/most efficient choices under the system. It will be interesting to see what happens here. With such a big field the draw will have a big influence in what transpires. The match ups you get (and can avoid) will be key to the outcome. I own a couple of ROB Gameboards plus two extra tiles. The two spare tiles have been unpainted for about three years while one of the two boards was first Chaos Wastes then Desert themed. My main board is a fully flocked Grassy Plain and I decided that I would convert the eight other tiles to the same theme. There were a couple of reasons for this. First, it allows me to have a 14' x 4' table for large multiplayer games. Second, it allows more variety in table set up for other games. 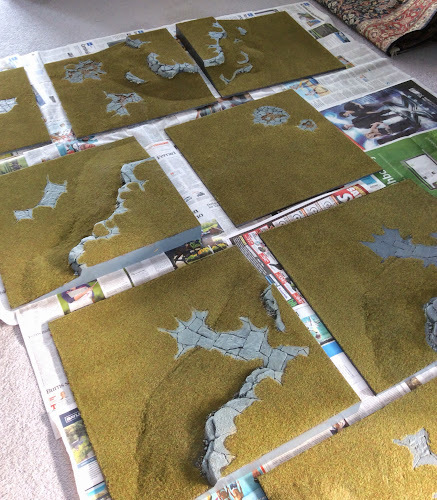 So on Saturday I set about converting the eight tiles to fully flocked. If you are going to do this I recommend that you buy one of the Citadel Scenery Kits as this is the best way to buy good quality static grass in bulk. It has a 200g bag of Grass which is equivalent to eight of the GW static grass packs. You also get 25g of the lighter Glade Grass static grass. I didn't use the GW Calthan Brown instead preferring to use the Resene test pot "Creole" which I use on all my model bases. I used a grey spray to base the rocky outcrops over this base (itself on a flat black primer). After the necessary drydrushing of the rocks I started flocking. I use thick PVA and then apply the static grass using an electrostatic shaker. This gives a thick covering but also ensures that the grass stands up. You need to wait a couple of hours and then you can shake off excess. I will then leave it for 24-48 hours and giving it time to dry before giving it a final shake. Looking forward to getting a few games using the full table over the coming months. 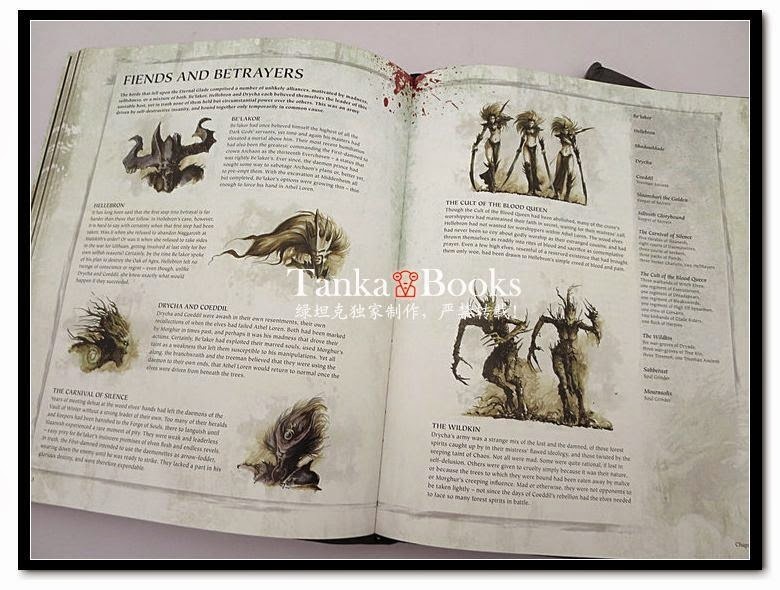 A picture of the new models accompanying the last instalment of the End Times has made it to the net. In it you can see the new Bloodthirster (top right), the Skullreapers (bottom right) and Wrathmongers (bottom left). You can pretty much confirm that they have the requisite number of skulls to push them from Grimdark all the way to Khorne. 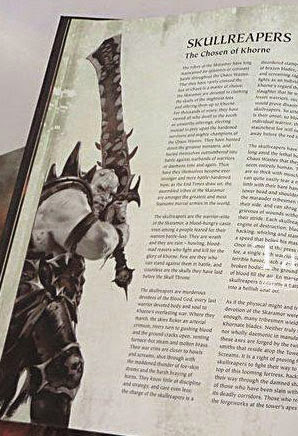 Interesting that the Archaon model looks like the existing one. Thought we might see it in plastic. However remember there are still rumours of a new Chaos dragon floating around. 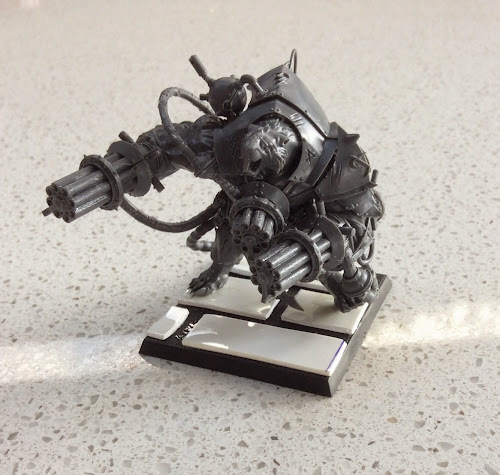 I purchased a box of the new Stormfiends when they were released. 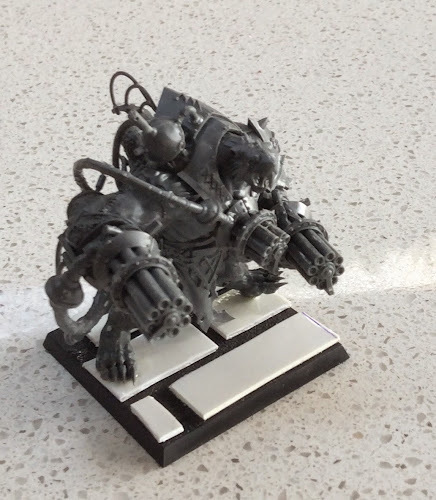 While I was waiting for them to arrive I realised that the sprues only gave you the ability to kit one out with Ratling Cannons. So I knew there would need to be some Clan Skyre improvisation. He is packing the three very heavy Ratling Cannons you get with the kit. However if you went from straight out of the box any RC Stormfiends would all have the same pose. 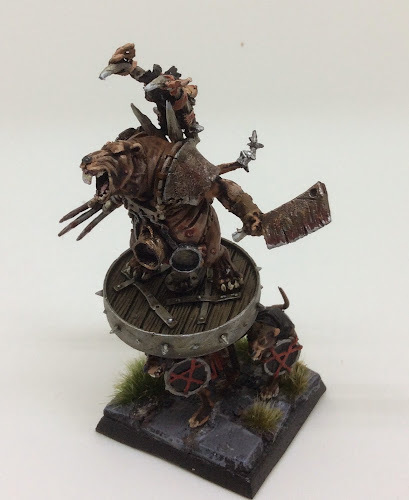 From me Skaven need more variety. A quick email to a couple of locals and Ryan hooked me up with the necessary parts. It is worth remembering Ryan's role in all this when my Stormfiends destroy your prize unit. 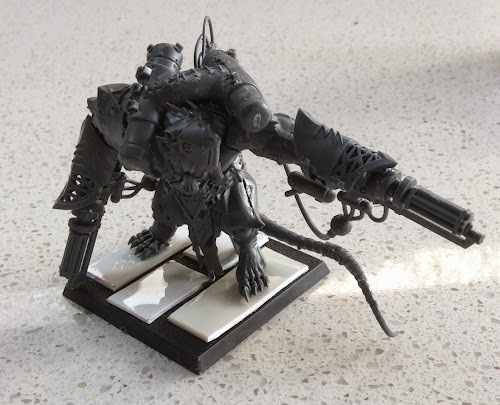 The first conversion is of the Warpfire Stormfiend and involves Space Marine assault cannons. I have use this before to make my Ratling Gun teams from the metal Warpgrinder weapon team. It is an obvious conversion but sometimes simplicity is best. 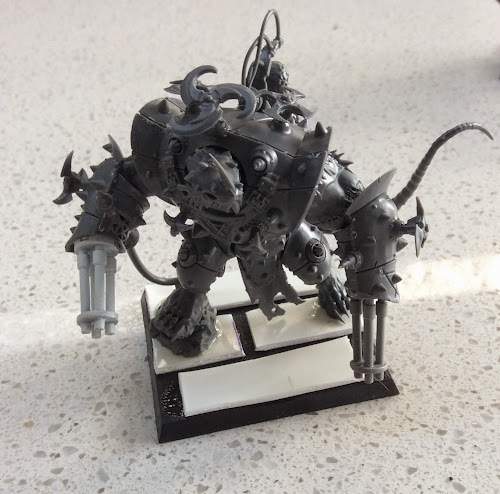 The second conversion is of the CC Stormfiend. 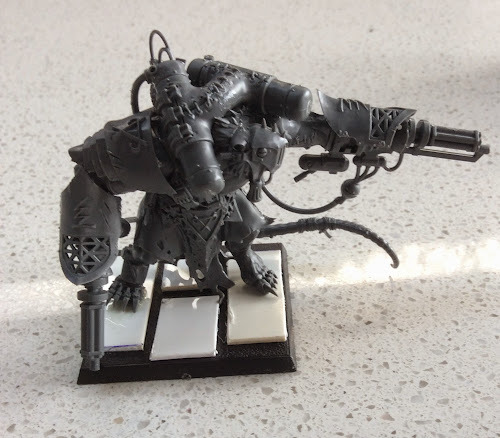 Here I wanted to get som variety in the models and so rather than just use the AC again I have used the Tau Burst Cannon - easy to get as what Tau player uses Burst Cannons? 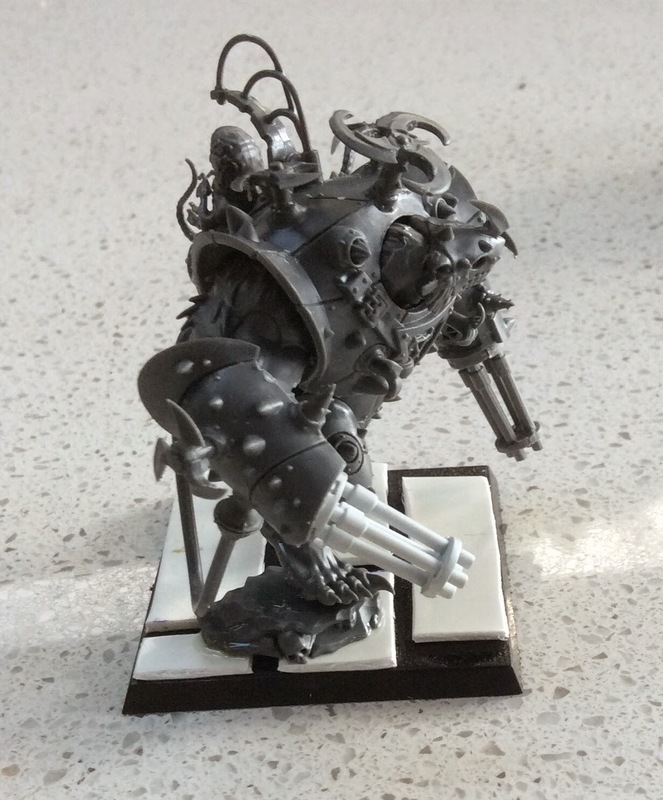 These are heavier and I think give the Stormfiend a more "Verminator" look. Given the tunnelling rules I wanted to give my unit the opportunity to use the Warpgrinder. You have the pieces left over from the RC Stormfiend. I used two of these to make the necessary adjustments to an Island of Blood Rat Ogre. He's a little bit smaller than the new Stormfiends and I may look to bulk him up a bit. Either that or can't him "Runt". So a morning's work and I have a unit of 4 Stormfiends with 3 RC and a Warpgrinder. Now to the painting table! I see the End Times as an exciting part of the Warhammer scene and I think that it provides a shake-up which is great for the game. But the problem comes when we start to talk about tournaments. It is fair to say that some things in the End Times ratchet up the power level so that they is a strong possibility that non-ET armies can't compete. I've been thinking about what I would do to ensure as level playing field as possible. This all assumes that characters in ET lists have access to their "home" Rulebook items. It also assumes Rulebook Magic. There is still one book to come and that will necessitate further consideration. The issue that definitely requires further discussion is the Lore of Undeath and I intend to devote a post to that tomorrow. Interested on thoughts on the broad suggestions above. The sign-up for WargamerNZ has been very encouraging. The first three days saw more than 130 people sign up to the Forum. New sections and sub-forums have been added where the has been a demand suggested. Hopefully we'll continue to see organic growth from the community. If you haven't checked it out there is a link below the banner of this website. For those interested the latest draft of the 2015 ETC Comp can be found here. Remember there are a series of house rules that accompany it so it shouldn't be considered entirely in isolation. My own thoughts are that the development of the comp seems to be following a familiar pattern. When the AR.Com was put together they signalled a fresh approach to comp and overall a lighter level of comp. To some degree they have achieved that in that they have introduced a pool system and are now allowing Special Characters but - and this is a big "but" - this is ETC. With each new draft and this is the fourth, more and more comp gets plastered over the original edifice. Pure chance says that if you set a desired level of comp, there is an equal likelihood of things being under-comped as over-comped. However that has not been the case here. As the drafts are released we see only more restrictions which means it progresses further away from their initial offering in terms of restrictions. It also seems to be getting increasing bloated as the new layers are added. I don't begrudge the AR.Com their role as it seems at each step they are having to appease a coordinated effort that has railed against loosening the comp even though that is what the majority of nations voted for.They have indicated that there is at least one more draft of the comp pack to comp and I suspect that is optimistic. I'd be very surprised if there are not two-three iterations before it is finalised. And I don't think that I'm going out on a limb here to say that each will see a further tightening of the comp. One of the forums I browse had a thread recently "Warhammer Fantasy - What Went Wrong?" I thought that it might be an interesting read to get some differing perspectives. 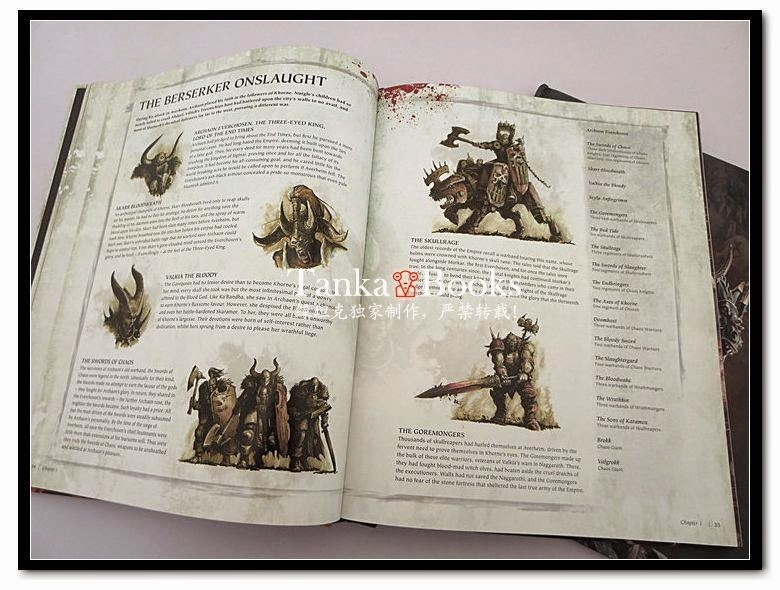 Regular readers will know that I love the Warhammer 8th Ed rule set finding it far more balanced than its predecessor. This is especially so as the cycle of Warhammer Army Books has progressed. One of the main reasons is that the game has IMO become one of risk management rather than spatial awareness. While a lot of critics decry it as randomhammer there are a fair percentage who remember 7th WHFB as the "carpentry edition" (all angles and micro-measurement). So reading through the thread I quickly realised that a lot of the commentators either hadn't played 8th or "tried one game and it wasn't for me". The forum is primarily US based and, apart from Australia, that appears to be the centre of anti-8th feeling. Not all of the USA - because in essence it is a series of countries wargaming wise, but significant pockets. A common refrain was that things like random charge distances take the skill out of the game. Again IMO this is so far from the truth that you really struggle to give credence to their other observations. It takes different skills - you need to be able to risk weight outcomes and determine whether you need a credible Plan B in the event you upset the dice gods! Now I'm not saying 8th is without fault but army balance relative is not one of them. 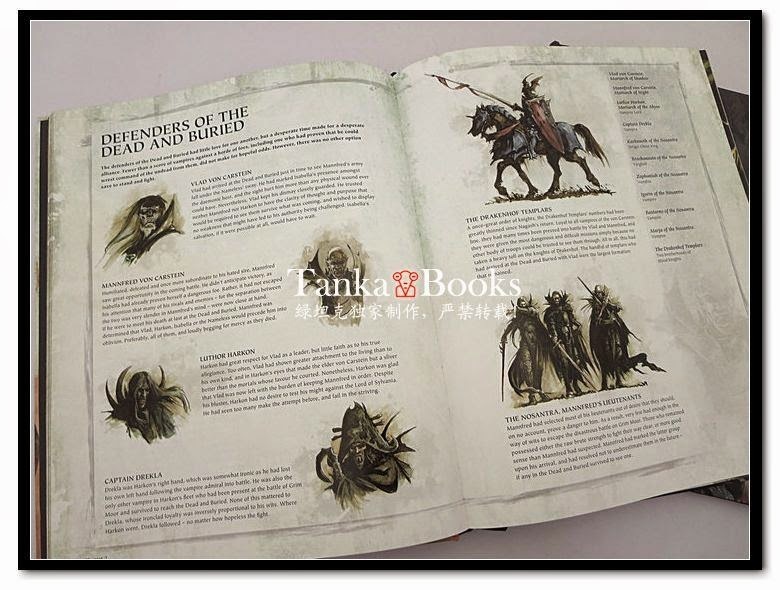 People seem to forget the troika of Vamps, Daemons and Dark Elves that dominated 7th ed events. They forget the UKGTs with three identical lists (give or take one unit) dominating the top 25 tables. The tournament game required far more comp than it does now - pre ET (where we are seeing some old probs resurface). What I'm not sure is how people who haven't played the game can say that another version was better. Sure, you can say the current version isn't to your liking or that you preferred the other but that is subjective rather than objective. I know in my case I never really played 5th, 6th or 7th 40k. As such I have no idea if they were better than 4th and could never make an objective assessment as to which is the better game. Anyway I found it amusing to read long dissertations on what was wrong with the game - stated as fact - and then find that they were backed by little or no objective experience. Us humans are funny animals. The new White Dwarf cover has been leaked and it shows the Harlequin Skyweaver Jetbikes. I've always had a soft spot for the Harlequins, given they were the only thing that added any interest to the post-Codex: Craftworld Eldar. 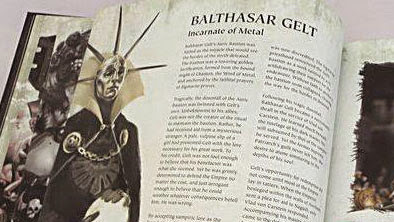 In fact they were the basis of the "Eldrad Alaitoc Clown Party" list I wrote in 2006-07. The thought of painting all those diamonds was the only thing that stopped that abomination ever seeing the table. I suspect somebody picked up the concept and ran with it. In the Nidzilla world of the time it certainly had some legs. So it's good to see them back and now with Jetbikes. Hopefully Jack will pick up a box or two to ally with his Dark Eldar. 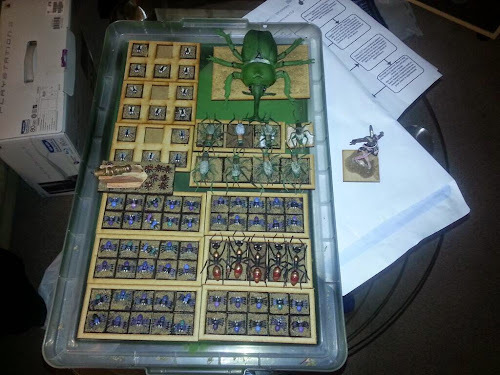 The Infamous "Insect" Army - Too Far? A couple of weeks ago I posted a picture of the army used to win the UK Masters. It was minimally painted, used proxy models and was designed - according to the winner - to illustrate why tournaments need comp. At the time the "bucket of bugs" was mentioned. The same player used a Daemon army at UK events and the 2014 ETC. It caused some disquiet in both communities, the normal rejoiner being that it showed "a lack of respect for the opponent". In the left foreground we have Horrors, on Cav bases are Flesh Hounds. The skirmish units are Furies; you can see a Skullcannon and the Beasts. I'm assuming the big gribbly at the back is a Greater Daemon. So all in all the units are easily distinguishable from one another. My question, as a TO, is whether as an event attendee you'd be happy to play against such an army? It's relatively clear what things are but would it impact your enjoyment? The latest Mierce Kickstarter has 7 days to go. As you might remember from the initial post this was aimed at taking some of their Darklands range and converting them for a Fanyasy setting. So far I'm going to say that I am pretty underwhelmed with the offering. I don't say that lightly as I generally love the Mierce sculpts. What I think is the issue here is that they lack the "Wow" value as for 80% of the models we've already seen the model. That means that they aren't new. My other concern is that the riders that they have shown for the various models seem a little clunky and the level of detail represented seems more akin to GW 15 years ago. Now this may just be the concept art. On top of this some things just don't work IMO - the Rat Beast with Warpfire Throwers in their mouths would test the ingenuity of even Clan Skyre. 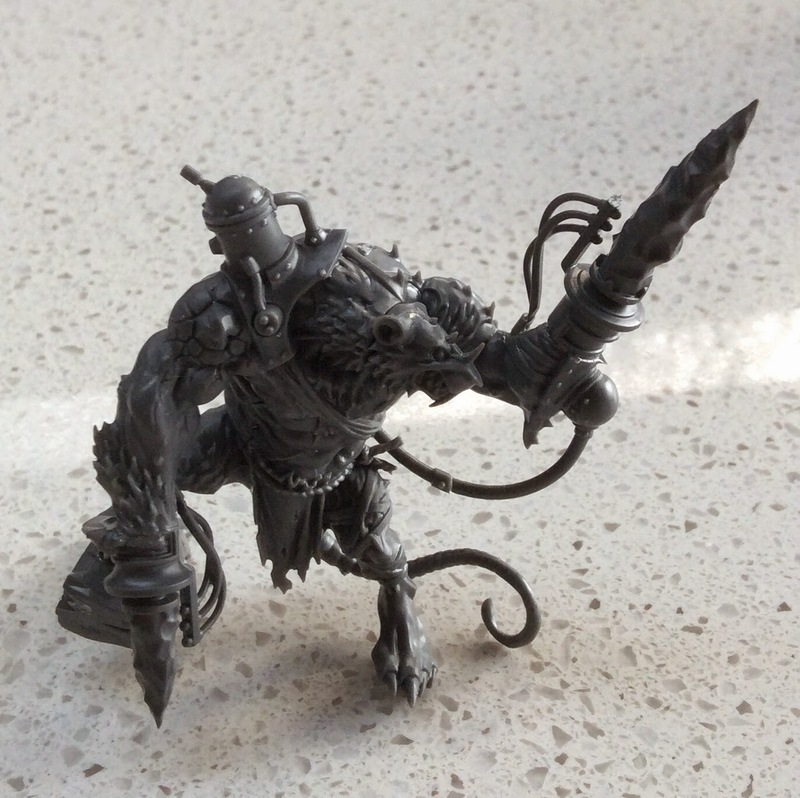 I do like the Master Moulder Rat figure and will look to pick that up. 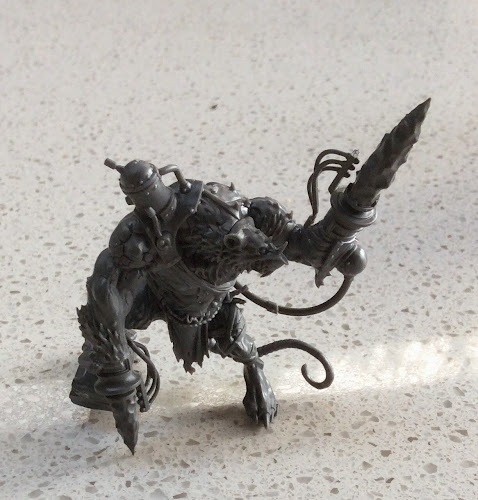 The attraction is twofold - first it is Skaven and second it is a brand new sculpt. I am waiting to see what we get in the last week....the Shaggoth holds appeal. The Mierce Plague Daemon suffers greatly in comparison to the Creature Caster offering however you can balance that with the knowledge that you won't have to suffer the delays - Mierce are get on meeting Kickstarter delivery deadlines. the Kickstarter is being pimped pretty heavily on various podcasts at the moment. Tim Fisher - the brains behind this offering - comes across as a really likeable character in the interviews he's done. I'm hoping that we'll see something truly startling in the last week. I've had the Mierce Darklands Vermkin Warlord and while watching cricket, league and football over the weekend I decided I'd paint him up. 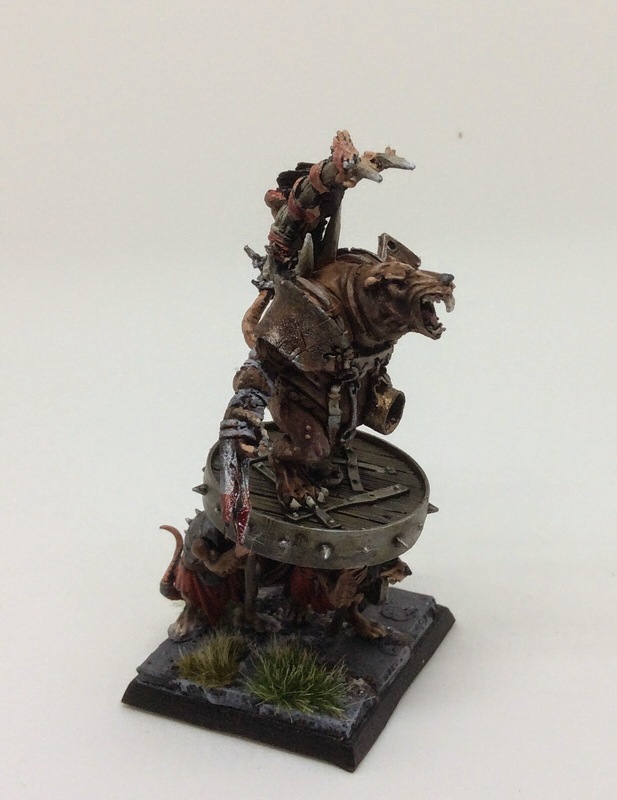 He is quite a big model - in Skaven terms - and so was never going to fit on a 20mm square base. I therefore decided to make him mounted on a Warlitter (40mm x 40mm). I wanted him to be quite fithly and gritty. Having read Thanquol and The Rise of the Horned Rat I was aware that the Warlord Clans didn't like the Clan Scruten (Grey Seers). Therefore I decided to make the litter out of a Wheel from a Screaming Bell. It's quite simple but I expect that Warlords aren't going to be driven by aesthetics. He being borne by three minions. 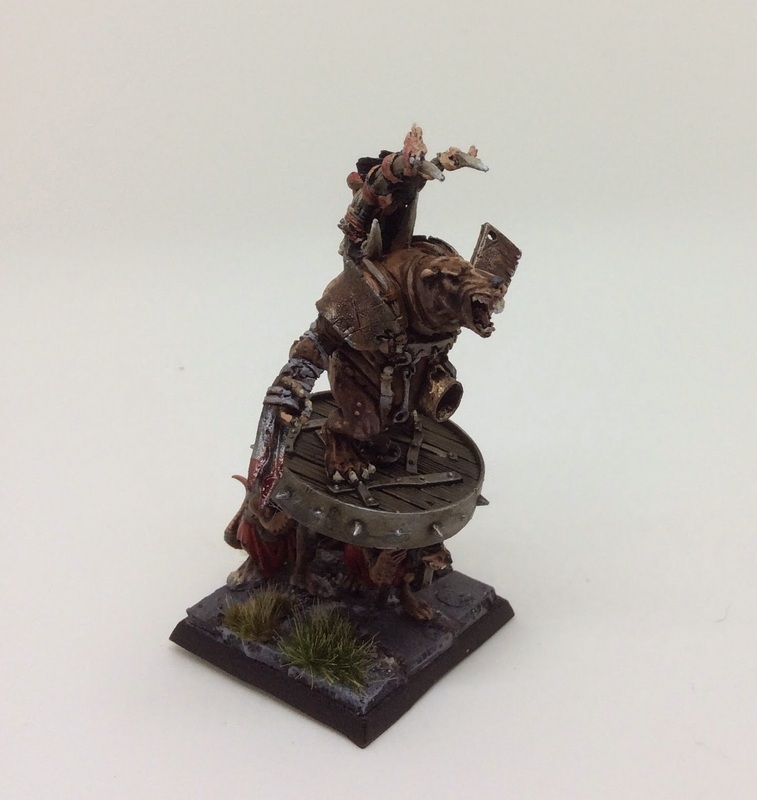 I used Clanrats to carry him rather than Stormvermin models as they are more hunched over and suffering. Next on the table is Skarsnik and Gobbla and then I have a terrain project I want to get going.